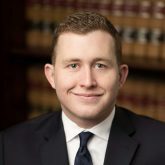 Ryan Murphy joined Sandulli Grace in 2017. He received his Juris Doctor from Boston College Law School and, prior to that, a bachelor’s degree in Computer Science from Boston College. He is licensed to practice law in Massachusetts and is pending licensure in New York. During law school, Ryan interned at Sandulli Grace and a labor law firm in New York City. He also competed in Mock Trial and Moot Court and represented clients through the Boston College Legal Services Clinic. Ryan is preceded in his lineage by four generations of union plumbers and two generations of union teachers. He is proud to represent working men and women in New England.